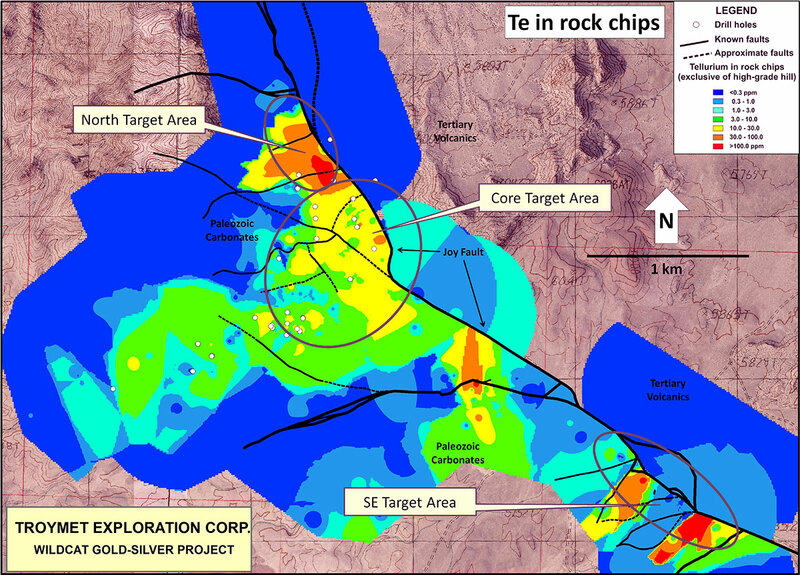 Troymet Targets the Core Area at Wi… | Troymet Exploration Corp.
January 19, 2016 - Troymet Exploration Corp. (TSXV: TYE) (“Troymet” or the “Company”) is pleased to update progress on its Wildcat gold-silver project in Juab County, Utah, where the Company has identified important drill targets in the highly prospective Core Target Area (Figure 1). 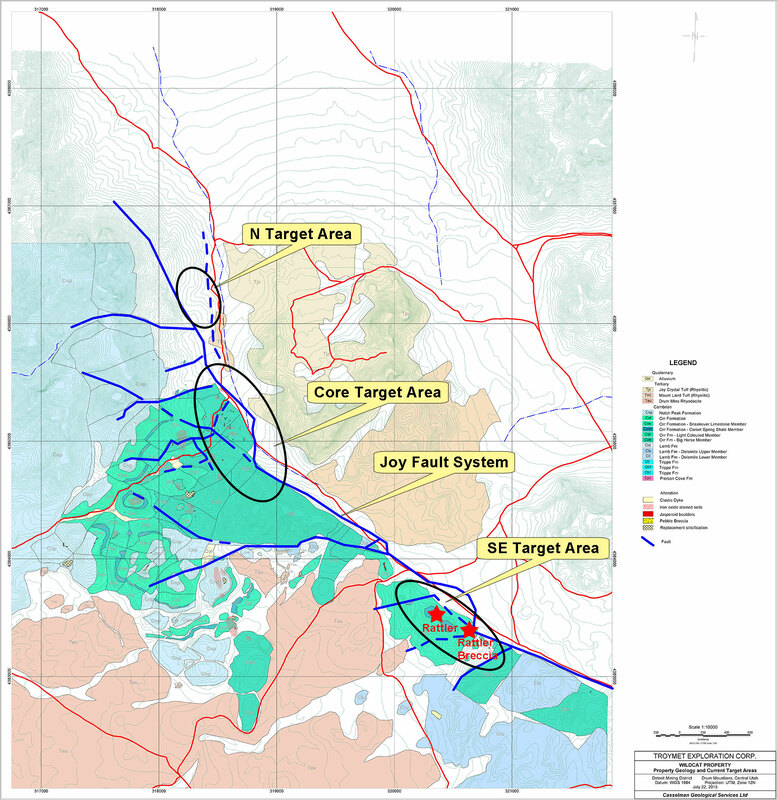 Troymet’s 2015 exploration program employed new exploration and targeting concepts which resulted in the identification of important new drill targets in previously unrecognized settings. 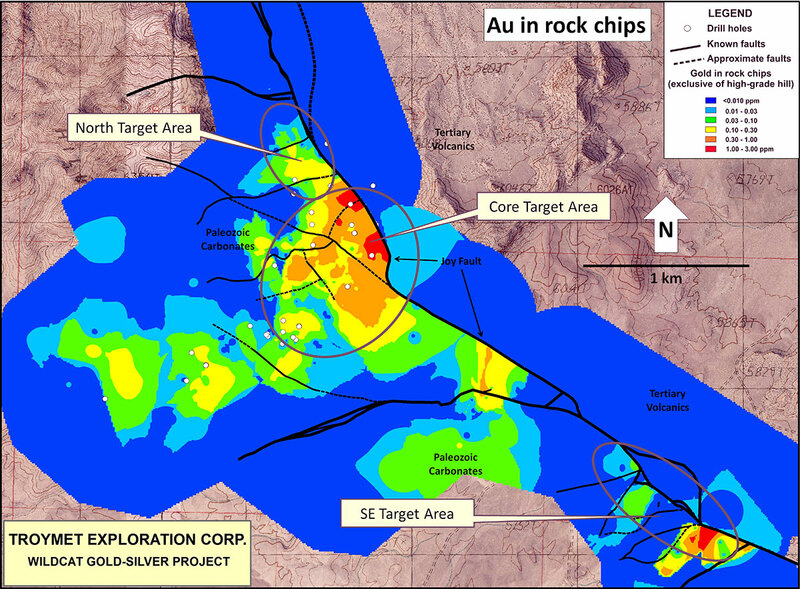 Detailed geological mapping, geochemistry and geophysics identified the potential structural controls of a large area of gold-in-rock chip mineralization as well as new drill targets in the Core Target Area. The Core Target Area encompasses a significant structural intersection on the Joy Fault where a step-over/ramp structure places Paleozoic carbonate rocks against Tertiary volcanic rocks of the Thomas caldera. Re-logging of drill-chips from the only hole collared in volcanic rocks in the area identified a possible volcano-structural depression and/or vent complex with possible tectonic and hydrothermal breccias. This structural depression and possible vent complex likely helped generate and focus the hydrothermal system in the step-over structure near the volcanic-sedimentary contact. The prominent magnetic lows that characterize this area strongly indicate pervasive alteration and demagnetization (Figure 2). 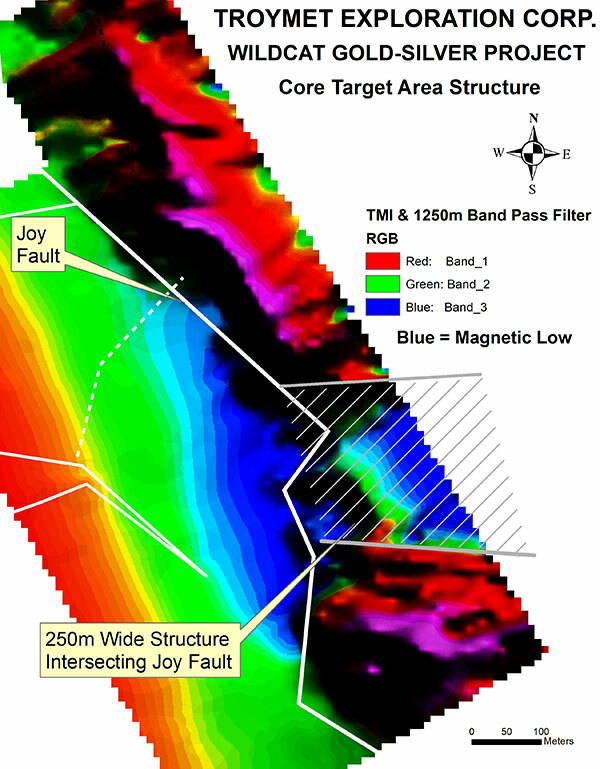 Troymet completed detailed bi-directional magnetic and EM surveys of this area in 2015. Processing of the magnetic data, which included advanced SI grid-based processing techniques and the use of directional filters, first and second vertical derivatives, tilt images, and high-pass filters, identified a number of concealed structures consistent with a step-over/relay ramp structure along the Joy Fault.The step-over/ramp structure occurs near the focal point of a radial set of mineralized jasperoids with gold concentrations ranging from near zero up to 301 ppm, and also at the focal point of project-scale geochemical vectors. This structural setting is the focus of a 2 km long rock chip geochemical zoning pattern where gold progressively increases towards the Joy Fault (Figure 3 & Figure 4). The pattern includes proximal bismuth, copper and silver and peripheral lead, tellurium and arsenic relative to the Joy Fault. Further confirming this pattern, principal component analysis shows that factor 2 scores, mapping a precious-metals related assemblage, progressively increase in strength as the Joy Fault is approached (Figure 5). This points to the metal-bearing hydrothermal system being located in the structurally complex area where magnetics strongly indicate pervasive alteration and demagnetization. A fence of two holes drilled in 1990, at the extreme north end of the step-over, intersected 7.6 metres of 0.56 g/t Au and 3.0 metres of 0.43 g/t Au in the shallow hole. The undercut hole intersected 22.9 metres of 1.27 g/t gold. As well, the High Grade hill discovery occurs in the Core Target Area (news release of November 17, 2015). 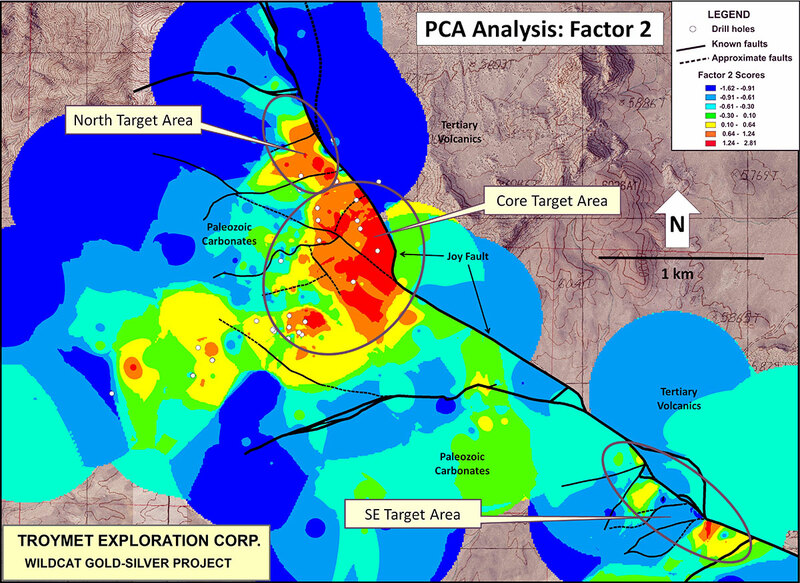 Troymet plans to drill test a number of attractive targets in this area which it believes have a high discovery potential for high-grade gold and silver mineralization in veins, stockworks, breccias and bulk-tonnage deposits along the Joy Fault and structural/stratigraphic targets in Cambrian carbonate rocks. All technical data, as disclosed in this press release, has been verified by the Company’s qualified persons Kieran Downes, Ph.D. P.Geo., and Mark Coolbaugh, Ph.D., CPG. Both are Qualified Persons as defined by National Instrument 43-101. Troymet will be attending the Vancouver Resources Investment Conference on January 24-25, 2016.